Katrina is a 40 year old single woman of Finnish origin living at home with her mother. She presented to the hospital ulcer clinic with bilateral foot and leg ulceration extending above the knee (Figure 1), accompanied by numerous other medical problems. The referral was made following a case conference held by the dermatology and rheumatology medical teams. Her medical history began at the age of 15 when she sustained a fractured hip following a road traffic accident. She made a slow recovery due to a number of reasons, including a wound infection. At the age of 20 Katrina was experiencing severe neck pain and stiffness in her shoulders. A provisional diagnosis of ankylosing spondylitis was made and she commenced treatment with non-steroidal anti-inflammatory drugs (NSAIDs). Her condition became unmanageable with her mobility reduced and the pain severe and unremitting. A decision was made to give spinal radiotherapy in an attempt to arrest the condition. This treatment was unsuccessful and she developed pain in other joints. Reduced mobility contributed to a continuous weight gain which exacerbated her condition. Following radiotherapy she developed a spastic bladder and incontinence requiring catheterisation. A decision was made 10 years ago to introduce high doses of corticosteroids to improve her joint condition and mobility status. Despite high doses of prednisolone her condition remained unstable and she continued to gain weight. Severe oedema of both lower limbs developed with staining and erythema. This was thought to be due to long periods of sitting in a chair without her legs elevated. Frequent bladder infections occurred, with colonisation of MRSA. She developed a number of leg ulcers, which were frequently sited around the upper half of the lower leg and behind the popliteal fossa. She complained of increasing pain which was no longer controlled by diclofenac sodium (Voltarol). The pain team commenced her on a regime of slow release morphine sulphate with amitriptyline hydrochloride (Amitriptyline). Katrina developed further lesions on her thighs and breasts. A number of biopsies failed to show anything other than the presence of chronic inflammatory changes, while extensive investigations failed to identify a connective tissue disorder. Later she developed diabetes, for which she required insulin, and rapidly complained of severe neuritic pain in both feet with bilateral sensory neuropathy. 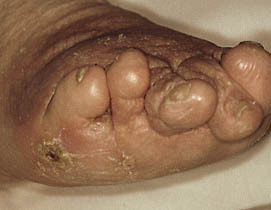 Bilateral foot ulceration occurred simultaneously on both second toes with underlying osteomyelitis ( Figure 2). Katrina was admitted to hospital in an attempt to review and control her condition. Investigations revealed that the high doses of steroids and immobility were leading to severe osteoporosis of the spine and hips. A case conference was held and the medical teams reviewed her condition. The consensus of medical opinion was that Katrina's current medical problems related to the steroidal drug therapy, which had induced diabetes and osteoporosis. The original diagnosis of ankylosing spondylitis was questioned. Both the vascular and dermatology teams could not determine a vascular origin for the leg ulceration, while acknowledging that diabetes was causing foot ulceration. Throughout this time the nursing team was aware of her considerable distress. She expressed disgust over herself and how the illness prevented her leading a normal life. A psychologist and psychiatrist were asked to assess her. A tentative diagnosis of Munchausen's syndrome was given in the absence of a medical cause of her wounds. It was suggested that this took the form of exaggeration of symptoms and self-mutilation. However, it was acknowledged that she now had considerable disease processes occurring as a consequence of steroid therapy and diabetes. Following this the hospital ulcer team was asked to plan effective treatment strategies. You may like to look at the following points before going on to read the outcome of this case. Do you think this patient is suffering from Munchausen's syndrome? Have you cared for people with self-inflicted wounds. Does this history seem similar to your experience? How do you find professionals react to patients presenting with self-inflicted injury? How would you prepare the medical and nursing teams to care for this patient? What support strategies should be put in place for Katrina and her mother during this time? What priorities of management are required in treating her ulceration? Would you place her on long-term antibiotics? How would you help staff to cope with this patient? Katrina knew that there was a central person responsible for her care and this helped to relieve some of the attention-seeking behaviour that had previously occurred. The appointment of a key worker also seemed to reduce the problems of manipulation between the clinicians by Katrina as all professionals were aware of the treatment programme, and she knew that care would not be changed without agreement from the key worker. Katrina continued to receive care on a daily basis from the community nurses but also attended the hospital every other week, during which time the diabetic podiatrist attended. The medical consultant responsible for her care was present at all these visits. Another important element of the key worker role was the provision of clinical supervision to the community nursing teams. Regular meetings allowed the team to express their own difficulties with dealing with this patient. These were of great importance in helping them to understand how their negative feelings were leading to inappropriate care. This was manifested in the avoidance of visits leading to a lack of continuity of care. Staff frequently resorted to blaming the patient for the development of new health problems, even when there was clear physiological evidence of why this was occurring. In addition, staff began to acknowledge the negative effects of labelling a patient. Katrina refused to see a psychologist, but support was given to the nursing teams. The medical management of Katrina focused on the treatment of all her interrelated conditions. The steroid therapy was gradually reduced, but was maintained at a low level as she continued to complain of severe joint pain. The reduction in steroids and significant weight loss resulted in an improvement in her diabetes such that one year later she was able to discontinue insulin and the diabetes was maintained through diet alone. Control of pain remained a major problem. Attempts to reduce levels of morphine were not achieved despite long-term involvement of the pain team. Cycles of bladder infection and cellulitis also continued to be problematic. Katrina remains on long-term antibiotics, developing a full blown sepsis if she discontinues treatment for more than three days. The foot ulceration improved over a six month period, although residual osteomyelitis is ongoing. Leg swelling continues to cause superficial leg ulceration which is contained by the use of bandages. Katrina continues to be supported by the multiprofessional team involved in all aspects of her care. If you have found this case study interesting, you may like to obtain a copy of an interactive CD Rom for transforming leg ulcer management - a computer based distance learning programme developed by the Centre for Research and Implementation of Clinical Practice and Wolfson Institute of Health Sciences at Thames Valley University. The CD comprises a picture gallery of over 100 common and rare types of leg ulcer, case studies which highlight the issues wound care professionals face every day and an illustrated glossary of terms used in the Leg Ulcer Reference. Copies of the CD are available from CRICP, Faculty of Health and Human Studies, 32-38 Uxbridge Road, Ealing, London W5 2BS. Price �24.95 plus �1.50 postage and packing.